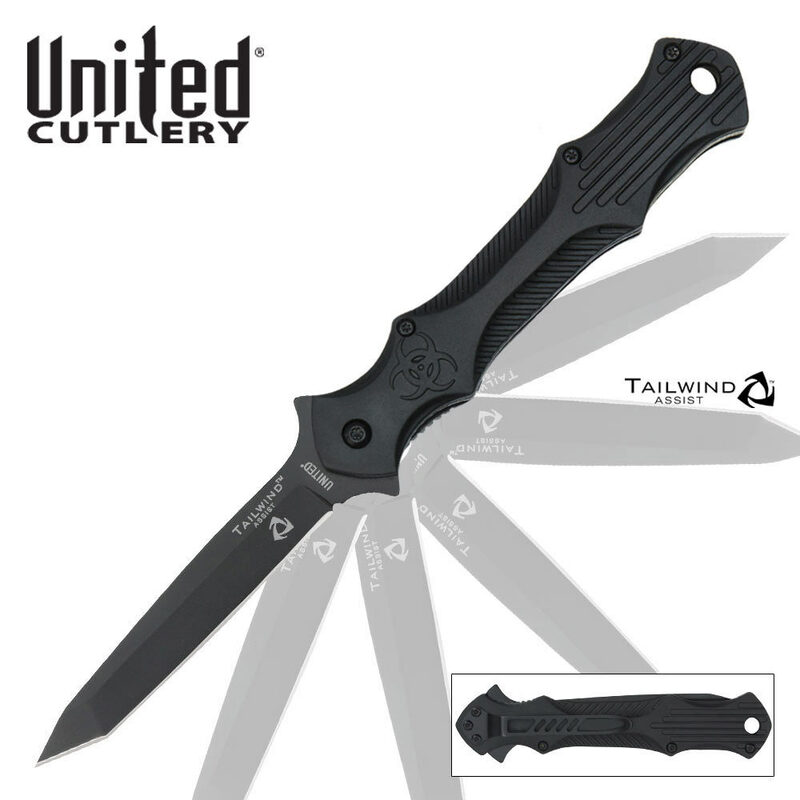 This high-powered stiletto spring assisted knife mixes style with tactical ability. 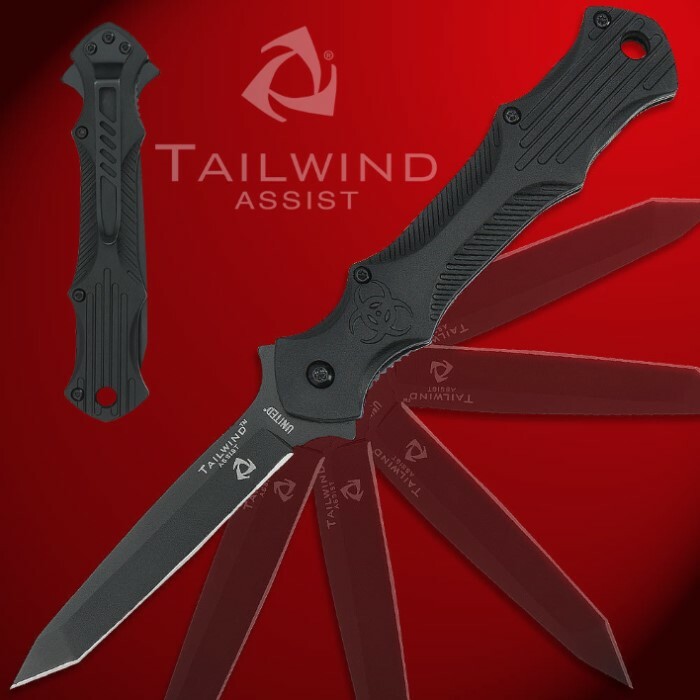 Built for self-defense, this piece is equipped with Tailwind spring assist technology for lightening fast blade deployment. The assisted-open mechanism is activated by pressing the blade spur on the back of the blade. The blade is forged from 7CR13 stainless steel, comes sharp from the factory, and is finished in black. The handle has a futuristic design with bio-hazard artwork, and provides a secure grip even when wet. The handle also features a belt clip for easy carry. 3 3/4 in. blade, 8 1/4 in. overall. This knife is sleak and practical. It has a very sharp blade and clean action. I got this BOGO and both knives are identical with no issues. Thanks BudK! I bought four of these blades and have one left everyone of my friends wants one so I been giving them away. Its a must have blade to own. going to be buying more of these.. I bought this knife several weeks ago and like the other tailwind knives I was not disappointed. And the blade was not as sharp as I would like so what a little sharpening won't hurt. I bought 3 of them. At $9.98 each, I bought an extra one for a backup, and one as a gift for my dad. The steel is a very durable 440 stainless steel which holds an edge well and is inexpensive. The handle is a very lightweight ABS plastic. It seems fairly well made for the price. The spring assist makes this act basically just like a switch blade. It's now my EDC knife. The knife's steel has impressed me. It cuts well from the box although once sharpened it holds an edge. I sharpened it two weeks ago and it still shaves hair. There's no play in the blade to the handle. It is solidly constructed. It is case quality if not better. If your questioning this knife there's no question. Get it. The spine of the handle is open with spacers and steel liners. The handle scales are hard plastic but the grooving provides plenty of grip. This knife has the quality of a 60 dollar knife. The black on the blade does not scratch or come off easily and is smooth.I rarely do this, and i sharpen other people's knives from time to time, it is excellent. Thank you budk. This is a well-built knife that I use for apples. The operating mechanism is smooth and the materials used are quite durable. The blade steel is excellent and can be sharpened to razor sharp. It fits the hand well and I enjoy the style.